PowerPro RTO Management System can be used in a Local Network across several computers (Multi) as well as in Standalone Mode (Lite and Single). With all versions, there is an initial price for the product and a yearly license fee which includes phone / on-line support, remote training, along with all updates/fixes to the software. * Any add on module activates the Training Plans function which is built-in to the Single and Multi versions but is disabled on the Lite version. 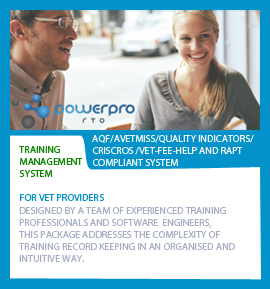 Click here to open the PowerPro brochure.